A great thing to remember when diving into your whisky journey is that everyone’s palate is different and unique. I might like something and give it magnificent praise, while you might think that it’s the worst whisky you’ve ever had in a cup. We here at scotchNsniff give you notes and reviews in hopes of shedding light about the whisky you buy, rather than the marketing campaigns built to sell the stuff to you. With that having been said, this next bottle for review is brilliant!! A lot of people assume that the older a whisky is, the better it is and of course that means that it can and must command a higher price tag. [Sniff] and I definitely don’t mind paying for the good stuff but we love finding a deal even more. I [Scotch] have found that I really enjoy the 17 year mark. Hibiki 17 year, delicious. The Macallan 17 year fine oak, superb. 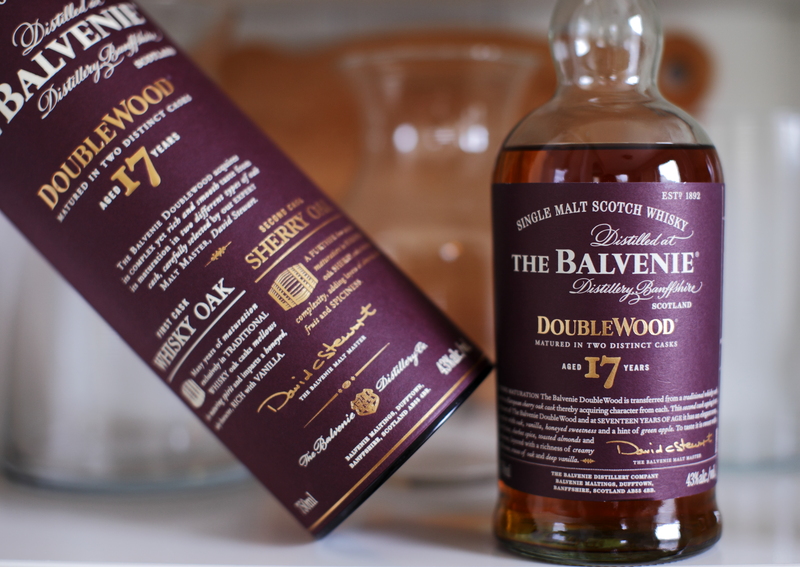 And now this, the Balvenie 17 yr DoubleWood. Color: Having spent the majority of the time maturing in traditional oak casks then the last couple months to a year in European Sherry casks, the color is A golden matte bronze with just the edge showing copper. Nose: I’m initially greeted with the classic Balvenie oak, soft vanilla and honeyed richness. That leads into bing cherries macerated in a liquer, almost like a kirschwasser. There are layers of green apple and turbinado sugar (less molasses-ey). A slight waft of toasted cereal and malted barley are in there after swirling. The nose is inviting and all of the aromas are well married and yet still distinct but showing no edges. Palate: The first sip of the whisky swirling around my mouth reveals a mexican cinnamon spice, not as harsh as McCormicks cassia cinnamon, along with green almond. Dried apple skins, red and green, coated in rich vanilla toffee. Throughout the entire taste, a very mellow but very pronounced Sherry surfboard carries all of these flavors down a great wave of fruit and spices. Awesome. Finish: The finish, although awfully short, just keeps you wanting more. There is a light spice and vanilla sherry sweetness that remains but it is short. This is a fantastic whisky that really shows how deliciously, both the Sherry and the Oak casks, can work together to form a great whisky. The price range seems to fluctuate between $99 to around $130, and for any price within that range, would be a great deal. For a price comparison to an equally great whisky, the Macallan 17 year Fine Oak is $190, but definitely not $70 better. Just want to say great job on the website and the reviews. My palate seems to be the same as yours so I enjoy reading what you guys enjoy as well. Your reviews r fantastic and understandable, as well as b easy to relate. Keep up the awesome website.